This article is about the film. For other uses, see Superman Returns (disambiguation). Superman Returns is a 2006 American superhero film directed and co-produced by Bryan Singer and written by Michael Dougherty and Dan Harris, from a story by Singer, Dougherty and Harris. It is based on the DC Comics character Superman and serves as a homage sequel to the motion pictures Superman (1978) and Superman II (1980), while ignoring the events of Superman III (1983) and Superman IV: The Quest for Peace (1987), including its spin-off Supergirl (1984). The film stars Brandon Routh as Clark Kent/Superman, Kate Bosworth as Lois Lane, Kevin Spacey as Lex Luthor, with James Marsden, Frank Langella, and Parker Posey. The film tells the story of the title character returning to Earth after a five-year absence. He finds that his love interest Lois Lane has moved on with her life, and that his archenemy Lex Luthor is plotting a scheme that will destroy both Superman and America. After a series of unsuccessful projects to resurrect Superman on screen following the critical failure and box office disappointment of Superman IV: The Quest for Peace, Warner Bros. hired Bryan Singer to direct and develop Superman Returns in July 2004. The majority of principal photography took place at Fox Studios Australia, Sydney, while the visual effects sequences were created by a number of studios, including Sony Pictures Imageworks, Rhythm & Hues, Framestore, Rising Sun Pictures, and The Orphanage; filming ended in November 2005. Upon release, Superman Returns received generally positive reviews, with critics praising its visual effects, story, musical score, the performances of Routh and Spacey. However, it received criticism focusing on its runtime and lack of action sequences. While it was a box office success, Warner Bros. was disappointed with the worldwide box office return. A sequel was planned for a summer 2009 release, but the project was later canceled. The Superman film series was completely rebooted in 2013 with the film Man of Steel, directed by Zack Snyder and starring Henry Cavill as Superman. For the previous five years, Superman has mysteriously abandoned his adopted home of Earth while on a journey into outer space to investigate what astronomers believed to be an intact Krypton. In his absence, journalist and past love Lois Lane wrote a scathing article "Why the World Doesn't Need Superman", winning her the Pulitzer Prize. Lois is engaged to Richard White, the nephew of Daily Planet editor-in-chief Perry White, and with whom she shares a young asthmatic son, Jason. Notorious criminal mastermind Lex Luthor secured an early release from prison due to Superman not appearing as a prosecution witness during Luthor's fifth appeal trial. By seducing an old heiress, Luthor is able to inherit her fortune, giving him resources for his next scheme. Superman returns to Earth, crash landing at the Kent farm, just as he did as a child. He reveals to his adoptive mother Martha Kent that he left hoping to find his homeworld, and expresses his dismay at being the only one of his kind remaining. Upon returning to Metropolis in his human identity of Clark Kent, he is shocked to discover the consequences of his disappearance. When a mysterious nationwide power outage causes catastrophic failures during a space shuttle launch, Clark realizes he must reemerge as Superman. Saving the shuttle and its ferry jet in highly public fashion causes a resurgence of media attention regarding Superman's return. Unbeknownst to anyone, the accident was triggered by Luthor using Kryptonian technology stolen from the Fortress of Solitude. Luthor sends his moll, Kitty, to distract Superman, allowing him to steal a sample of kryptonite from a museum. Still investigating the earlier power outage, Lois tracks the hypocenter to the mansion Luthor recently inherited and, along with her son, explores the yacht docked there. Discovering Luthor, she is held captive as the yacht heads out into the Atlantic. Luthor plans to use the Kryptonian crystal technology Superman used to create his Fortress of Solitude to create a new land mass which would swallow the continental United States. Placing a crystal inside a shell of refined kryptonite, Luthor triggers the new land growth by launching it into the sea. The Fortress of Solitude as depicted in the film. Lois manages to use a fax machine on board the yacht to send their location to the Daily Planet headquarters, where it catches the attention of Clark and Richard. Upon discovering her attempt at subversion, one of Luthor's henchmen attacks Lois, causing Jason's powers to emerge as he crushes the henchman with a piano – revealing that the (no longer asthmatic) Jason is Superman's son. Realizing this fact, Luthor and his thugs escape by helicopter as the earthquake effects from the growing landmass span back to Metropolis. While Superman works to contain the damage in the city, Richard reaches the yacht by way of a floatplane and releases Lois and Jason from their locked room. The three become trapped when the yacht is split in two by the growing rock formations, knocking Lois unconscious and sinking the yacht. Superman rescues them and gets them to the safety of Richard's plane. Superman pursues Luthor, who has made his way to the growing land mass. The kryptonite shell surrounding the crystal has caused the new rock formations to be infused with kryptonite, making the land itself toxic to Superman. Luthor and his thugs easily manage to brutalize Superman into submission as he is unable to fight back. Superman tries to flee, but Luthor stabs Superman with a kryptonite shard, before leaving him to drown. Regaining consciousness in the escaping floatplane, Lois learns that Superman has gone to confront Luthor. Knowing of the kryptonite danger, Lois convinces Richard to double back to help him. Jason spots Superman in the water and Lois and Richard get him into the plane, where Lois removes the shard. Recovering, Superman flies high into the atmosphere to regain his strength by exposure to sunlight. Using his heat vision, he then tunnels deep under the new land mass and, mass killed Luthor's henchmen, using the last of his strength, is able to fly it off into space before it absorbs more land. Escaping with Luthor in the helicopter, Kitty discards the remaining crystals and the two eventually end up on a deserted island when they run out of fuel. Complications from kryptonite exposure cause Superman to fall into a coma, and while doctors are able to remove more fragments from his skin, they cannot revive him. Lois visits him in the hospital and whispers into his ear while glancing at Jason. Soon after, hospital staff discovers his room empty. No longer feeling alone in the universe, Superman visits his newly revealed son in the boy's room and repeats to Jason the words of his own father as he sleeps. Lois starts writing another article, titled "Why the World Needs Superman". Superman reassures her that he is now back to stay, and flies off into space, where he gazes down at the world. Brandon Routh as Clark Kent / Superman: The Kryptonian superhero who disguises himself as a journalist. Director Singer believed only an unknown actor would be suitable for the part. Routh was chosen from thousands of candidates interviewed at casting calls in the United States, United Kingdom, Canada and Australia. He had coincidentally auditioned for Clark Kent in the television series Smallville, but lost to Tom Welling. Routh had also met director Joseph "McG" Nichol for the role during pre-production of Superman: Flyby. Dana Reeve, wife of Christopher Reeve, believed Routh's physical resemblance to her late husband was striking. To obtain the muscular physique to play Superman convincingly, Routh underwent a strict bodybuilding exercise regimen. Prior to Routh's casting, Singer had X2 actor Daniel Cudmore audition. Kate Bosworth as Lois Lane: A reporter who works with Clark Kent at the Daily Planet, and former lover of Superman. Spacey recommended Singer to cast Bosworth in the role because she co-starred with Spacey in Beyond the Sea (2004) as Sandra Dee. Claire Danes and Keri Russell were reportedly considered for the role. Amy Adams, who would later be cast as Lois Lane in the 2013 reboot Man of Steel, confirmed in an interview that she had also auditioned for Lois in 2005. Adams had previously auditioned for Lois in 2003 when Brett Ratner was planning to direct Superman: Flyby. Bosworth studied Katharine Hepburn's acting for inspiration, particularly in The Philadelphia Story (1940) and Guess Who's Coming to Dinner (1967), as well as Julia Roberts in Erin Brockovich (2000). James Marsden as Richard White: The nephew of the Daily Planet editor-in-chief Perry White and fiancé to Lois Lane. Marsden said Richard acts as an emotional challenge for Superman, since the hero comes back to find that "Lois Lane picks somebody who's very Supermanesque". Frank Langella as Perry White: The editor of the Daily Planet. Hugh Laurie was originally attached to the role. Eva Marie Saint as Martha Kent: Clark Kent's adoptive mother. Parker Posey as Kitty Kowalski: Lex Luthor's henchwoman. She served as a prison nurse and would give Lex his examinations. The character is based on Eve Teschmacher from the 1978 film, portrayed by Valerie Perrine. Posey was the only actress considered for the role. Kal Penn as Stanford: One of Luthor's henchmen. Sam Huntington as Jimmy Olsen: a photographer at the Daily Planet and a friend of Clark. Kevin Spacey as Lex Luthor: An evil sociopath armed with vast resources and an extensive knowledge of science who is Superman's nemesis. Because of his Academy Award-winning performance in Singer's film The Usual Suspects (1995), and friendship with the director, Spacey was the only actor considered for Lex Luthor. The writers specifically had Spacey in mind for the part when writing the script. Spacey's version of Luthor has the same comically exaggerated vanity and pompous arrogance of the earlier Gene Hackman version as well as the same strong interest in real estate, but Spacey's version is far less campy and more serious. Spacey later said that director Singer told him to play the character as "darker and more bitter" compared to Hackman and not to use the earlier portrayal as an inspiration. Marlon Brando appears posthumously as Jor-El, Superman's biological father. Brando, who died in 2004, reprises his role from the 1978 film through the use of previous footage combined with computer-generated imagery. This required negotiations with Brando's estate for permission to have his footage used. Singer explained, "We had access to all of the Brando footage that was shot. There was unused footage that had Brando reciting poems, trailing off subject and swearing like a sailor." Tristan Lake Leabu stars as Jason White, the son of Lois Lane and Superman. The question of whether Superman or Richard is Jason's father is initially unclear. He suffers from asthma and other ailments, but it is later revealed that he is the son of Superman, when he displays superhuman strength and discomfort around Kryptonite. Peta Wilson appears as NASA spokeswoman Bobbie-Faye. Jack Larson, who portrayed Jimmy Olsen in the 1950s television series Adventures of Superman, makes a cameo appearance as a bartender. Noel Neill—who portrayed Lois Lane in the television series and the film serials Superman (1948) and Atom Man vs. Superman (1950)—appears as Luthor's elderly wife Gertrude Vanderworth. Richard Branson cameos as the engineer aboard the space shuttle. Another of Luthor's henchmen (Riley) is played by former Australian Rugby League player Ian Roberts. Director and producer Bryan Singer conceived the storyline of "Superman returning to Earth after a five-year absence" during the filming of X2 (2003). He presented the idea to Lauren Shuler Donner and her husband Richard Donner, director of Superman (1978). Donner greeted Singer's idea with positive feedback. In March 2004, Warner Bros. was commencing pre-production on Superman: Flyby, which had a target theatrical release date of June 2006. McG was signed to direct with a script by J. J. Abrams, but dropped out in June 2004. That same month, Singer was approached by Warner Bros. to pitch his idea for Superman Returns, as he was preparing to leave for Hawaii on a short vacation with his X2 writers Michael Dougherty and Dan Harris. While in Hawaii, Singer, Dougherty and Harris began to outline the film treatment. In July 2004, Singer signed on to direct and develop Superman Returns. Although he was not a comic book fan, Singer was most impressed with Donner's 1978 film, citing it as an influence of his, Dougherty and Harris's writing. With Singer's hiring, he dropped out of X-Men: The Last Stand (2006) and also had the Logan's Run remake pushed back. Superman Returns was financed 50/50 between Warner Bros. and Legendary Pictures, and pre-production began in November 2004. By February 2005, Dougherty and Harris had written six drafts of the script. Early versions of the script contained references to the September 11 attacks before they were removed. Warner Bros. considered shooting Superman Returns at Warner Roadshow Studios in the Gold Coast, Queensland, Australia. After filming, this could have been used as an attraction for the adjoining Warner Bros. Movie World theme park, but the idea was scrapped for being too expensive. Set construction started in January 2005 at Fox Studios Australia for the film's 60 setpieces, while the start date was pushed back for two weeks. In an attempt to avoid public attention, Superman Returns carried the fake working title of Red Sun during filming. Starting in late March 2005, principal photography lasted until November. Filming of Superman Returns in New South Wales constituted hiring thousands of local workers, generating over $100 million into the local economy. 80% of filming took place at Fox Studios Australia, occupying all nine sound stages. Scenes set in Smallville were shot at Tamworth, while the Australian Museum doubled for the Metropolis Museum of Natural History. A digital recreation of Marlon Brando in the film, as Jor-El. Superman Returns was shot using Panavision's Genesis digital camera. Production designer Guy Hendrix Dyas was influenced by Frank Lloyd Wright's Johnson Wax Headquarters for the design of the Daily Planet. ESC Entertainment was originally set to design the visual effects sequences, but Warner Bros. replaced them with the hiring of Mark Stetson from Sony Pictures Imageworks as the visual effects supervisor. A total of 1,400 visual effects shots were created. The script required a scene of Superman safely delivering a Boeing 777 in a baseball park where computer-generated imagery was used as it would have been impossible to assemble the number of extras for the shots. A second unit crew traveled to Dodger Stadium to photograph elements that were composited into the final images. The scenes of Metropolis was actually a modified version of the skyline of Manhattan. Using footage from the original Superman (1978) film as a reference point, Marlon Brando was re-created by Rhythm & Hues using CGI. The opening credits for Superman Returns are presented in an intended recreation of the style used for Superman, again to the accompaniment of John Williams's theme music. Singer hired regular collaborator John Ottman as editor and film score composer months before the script was written. Ottman said in past interviews that John Williams, who composed the 1978 film, had influenced his decision to become a musician. He was both cautious and enthusiastic to work on Superman Returns. "Bryan [Singer] said he wouldn't even greenlight the movie if he couldn't use the John Williams music." Ottman continued, "it was important for me to preserve the Williams theme right down to every single note for the opening titles." Ottman referred to his work on Superman Returns as a homage to, not a ripoff of, Williams. Originally budgeted at $184.5 million, Warner Bros. placed the final production cost at $223 million, coming down to $204 million after factoring in tax rebates and incentives. Taking into account the development costs since the early 1990s, total expenditure is estimated to be around $263 million, with up to a further $100 million spent on worldwide marketing. 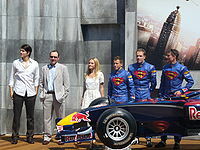 The Superman Returns cast with members of the Red Bull Racing team. Warner Bros. promoted Superman Returns at 2005 San Diego Comic-Con International. Singer and screenwriters Michael Dougherty and Dan Harris came up with the idea of publishing a prequel limited series, spanning four comic book issues. The stories were written by Jimmy Palmiotti, Marc Andreyko, and Justin Gray, with artwork by Karl Kerschl and Matt Haley. During production, a series of "video diaries" on the Internet were released at BlueTights.net, showing behind-the-scenes work being done. After 27 installments, the video diaries stopped for a while shortly before the teaser trailer debuted on November 17, 2005. The main theatrical trailer premiered online on May 2, 2006. The trailer appeared in theaters on May 5, with prints of Mission: Impossible III, while the international trailer came with The Da Vinci Code and X-Men: The Last Stand. DC Comics published a comics adaptation by artist Matt Haley and writer Martin Pasko, Marv Wolfman wrote a novelization, and Electronic Arts developed a video game based on both the movie and the comics. The estimated cost of marketing Superman Returns in the United States was $45.5 million, the second-highest of the year behind Disney's $53.5 million campaign for Cars. Warner Bros. made tie-in deals with General Mills, Burger King, Duracell, Pepsi, Doritos, Papa John's Pizza, 7-Eleven and Colgate. The film was also advertised with Red Bull Racing Formula One cars at the 2006 Monaco Grand Prix. David Coulthard managed to get the team's first top three finish that day; on the podium, he wore a Superman cape in celebration of his achievement. NASCAR Sprint Cup champion Jeff Gordon also sported the "Man of Steel" look by promoting the movie on his #24 Chevrolet Monte Carlo in the 2006 Pepsi 400 at Daytona International Speedway. Troy Bayliss appeared in promotional "Superman" leathers and sported a cape on the podium following a win and a 2nd place at the 2006 Brands Hatch Superbike World Championship round on his way to winning that year's championship. The National Geographic Channel released The Science of Superman on June 29, 2006: a television special that studied popular science analogies with the Superman mythos. Singer admitted at 2006 Comic-Con International that he was dissatisfied with the marketing and promotion. "A lot of people did their job, and a lot didn't". Bryan Singer convinced Warner Bros. not to experiment with test screenings. In addition, Singer removed 15 minutes of footage from Superman Returns after showing it to some of his "trusted associates". The final theatrical time length ran at 154 minutes. Warner Bros. originally slated the movie for release on Friday, June 30, but moved it up to Wednesday, June 28. Superman Returns was released on June 28, 2006 in the United States and Canada in 4,065 theaters. The film ranked at the top in its opening weekend, grossing $52.5 million. Superman Returns: An IMAX 3D Experience was released simultaneously in 111 IMAX-format theatres worldwide, which included 20 minutes of converted 3D film material. It was the first Hollywood full-length live-action film to be released in this combined format. One of the key scenes Singer took out was "the Return to Krypton sequence". Ten million dollars was spent on this sequence alone, but it was deleted. Singer noted that it could not be released as part of a DVD featurette because it was converted to IMAX 3D. He hoped it could have appeared in an IMAX reissue. The film's second-week gross rapidly declined from the first week, due to the presence of Pirates of the Caribbean: Dead Man's Chest and The Devil Wears Prada. Superman Returns went on to gross $200,081,192 in North America and $191 million internationally, earning $391,081,192 worldwide. Domestically, the film was the sixth-highest-grossing film of 2006. In worldwide totals, Superman Returns was ninth-highest. On Rotten Tomatoes, Superman Returns has an approval rating of 75% based on 260 reviews, with an average rating of 7/10. The site's critical consensus reads, "Bryan Singer's reverent and visually decadent adaptation gives the Man of Steel welcome emotional complexity. The result: a satisfying stick-to-your-ribs adaptation." On Metacritic the film has a score of 72 out of 100, based on 40 critics, indicating "generally favorable reviews". Audiences polled by CinemaScore gave the film an average grade of "B+" on an A+ to F scale. Richard Corliss of Time praised Superman Returns, calling it one of the best superhero films. He was mostly impressed with Singer's direction and the storyline. Joe Morgenstern from The Wall Street Journal also gave a positive review, but observed Routh's and Bosworth's acting was "somewhat dead or super average. Nothing special." Morgenstern believed Lex Luthor's characterization was "well written by the writers and well played by Kevin Spacey". He also praised Newton Thomas Sigel's cinematography and Guy Hendrix Dyas's production design. Peter Travers, writing in Rolling Stone, felt the film "perfectly updates Superman for the modern audience". J. Hoberman of The Village Voice called it "surprisingly well made. It's a summer blockbuster filled with mythology and sensitivity." James Berardinelli reacted positively to the movie, comparing it favorably with Richard Donner's 1978 film. He felt Spacey was better than Gene Hackman as Lex Luthor, describing him as "more cruel and less flippant" than Hackman. "There are no miscasts to be found in the supporting cast, either," Berardinelli said. "Superman Returns is near the top, if not at the top of the superhero movie pile. It offers nearly everything: romance, action, humor, and plenty of goose bumps." However, Roger Ebert argued the film was a "glum, lackluster movie in which even the big effects sequences seem dutiful instead of exhilarating." He also felt that "Brandon Routh lacks charisma as Superman", surmising that he "may have been cast because he looks a little like Reeve". Mick LaSalle of the San Francisco Chronicle felt that Warner Bros. should have rebooted the series along the lines of Batman Begins. He also felt Bosworth, at 22 years old, was too young to portray Lois Lane, and the climax did not "match the potential of the tiring 154-minute-long film". On May 3, 2009, almost three years after the debut of Superman Returns, the Academy Award-winning filmmaker and screenwriter Quentin Tarantino declared his appreciation for Bryan Singer's directorial work on Superman Returns and that he would write a 20-page review about Superman Returns. On January 9, 2012, more than five years after the movie was released, the independent film community daily news site IndieWire released a two-part video essay that probes the melancholic nature of Superman Returns. Produced by Matt Zoller Seitz and Ken Cancelosi, the critique was inspired by a review that Seitz wrote for the New York Press in 2006, in which he stated that "From the moment its hero returns to the sky to rescue Lois Lane from a plummeting jet, Superman Returns flirts with greatness." In 2013, Singer stated that Superman Returns was made for "Perhaps more of a female audience. It wasn't what it needed to be, I guess." Singer stated that he would have cut about the first quarter off of the film and started it with "the jet disaster sequence or something. I could have grabbed the audience a little more quickly. I don't know what would have helped. Probably nothing. If I could go again, I would do an origin. I would reboot it." Empire ranked the movie 496 on its "The 500 Greatest Movies of All Time" list, stating, "It may have been a slighter return than some people had hoped for, but Singer's vision of the Man of Steel is an heroic effort. Plenty of spectacle and a lot of heart helps Kal-El soar." Superman Returns was nominated for both the Academy Award for Best Visual Effects and BAFTA Award for Best Special Visual Effects, but lost to Pirates of the Caribbean: Dead Man's Chest. The film was successful at the 33rd Saturn Awards, winning Best Fantasy Film, and categories for Direction (Bryan Singer), Best Actor (Brandon Routh), Writing (Michael Dougherty and Dan Harris) and Music (John Ottman). Kate Bosworth, Tristan Lake Leabu, James Marsden, Parker Posey, and the visual effects department were nominated for categories. However, Bosworth was also nominated a Razzie Award for Worst Supporting Actress. Superman Returns debuted on DVD on November 28, 2006 in two versions, one with a single disc, and a double-disc edition which featured over three hours of behind-the-scenes features. That same day, a 14-disc DVD box set titled Superman Ultimate Collector's Edition was released, containing special editions of all five Superman films, as well as the documentary Look, Up in the Sky: The Amazing Story of Superman. It debuted at the top spot of the DVD charts, and also generated $13 million in rentals during its first week. The film was also released in both high-definition formats, HD DVD, which featured both standard and high definitions on the same disc, and Blu-ray. It was the best-selling title on both formats in 2006, and was among the best-sellers of both formats of 2007. 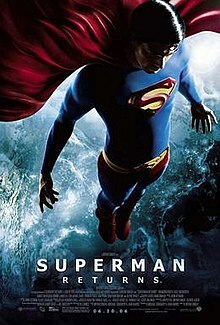 In February 2006, four months before the release of Superman Returns, Warner Bros. announced a mid-2009 theatrical release date for a sequel, with Bryan Singer reprising his directing duties. Brandon Routh, Kate Bosworth, Kevin Spacey, Sam Huntington, Frank Langella, and Tristan Lake Leabu were to reprise their roles. Due to his commitment, Singer dropped out of directing a remake of Logan's Run and an adaptation of The Mayor of Castro Street. Writer Michael Dougherty wanted the sequel to be "action packed", featuring "other Kryptonians" with Brainiac and Bizarro also considered for primary villains. The "New Krypton" landmass floating in space at the end of Superman Returns would have served as a plot device. Although Superman Returns received mostly positive reviews, Warner Bros. and Legendary Pictures were disappointed by the film's box office return. Warner Bros. President Alan F. Horn explained that Superman Returns was a very successful film, but that it "should have done $500 million worldwide. We should have had perhaps a little more action to satisfy the young male crowd." Singer reacted incredulously to the studio complaints, saying, "That movie made $400 million! I don’t know what constitutes under-performing these days..." $175 million was the maximum budget Warner Bros. was projecting for the sequel, as Superman Returns cost $204 million. Filming for the Superman Returns sequel was to start in mid-2007, before Singer halted development in favor of Valkyrie. Filming was then pushed to March 2008, but writers Dougherty and Dan Harris left in favor of other career opportunities. The 2007–2008 Writers Guild of America strike pushed the release date to 2010. Singer still listed the sequel as a priority in March 2008, saying that the film was in early development. Routh expected filming to begin in early 2009. Paul Levitz, president of DC Comics, expected Routh to reprise the title role from Superman Returns before his contract for a sequel expired in 2009. However, with Warner Bros. deciding to reboot the film series, Singer dropped out in favor of directing Jack the Giant Slayer. In August 2008, Warner Bros. President of Production Jeff Robinov reflected, "Superman Returns didn't quite work as a film in the way that we wanted it to. It didn't position the character the way he needed to be positioned. Had Superman worked in 2006, we would have had a movie for Christmas of this year or 2009. Now the plan is just to reintroduce Superman without regard to a Batman and Superman movie at all." A reboot of the Superman film series titled Man of Steel was ultimately released on June 14, 2013, directed by Zack Snyder and with Henry Cavill starring as Superman. This would become the first film in the DC Extended Universe. ^ "Superman Returns (2007)". Box Office Mojo. Retrieved November 27, 2017. ^ a b Chattaway, Peter (June 28, 2006). "Superman Returns". Christianity Today. Retrieved April 27, 2010. ^ Dargis, Manohla (June 27, 2006). "'Superman Returns' to Save Mankind From Its Sins". The New York Times. Retrieved April 27, 2010. ^ "Superman Returns - Side Effects Software Inc". Archived from the original on 2013-06-16. ^ Steve Head (2006-04-12). "Superman Returns: Casting the Man from Krypton". IGN. Retrieved 2008-11-06. ^ César G. Soriano (2004-11-04). "New guy in the cape finds he's a snug fit". USA Today. Retrieved 2008-11-07. ^ Betsy Boyd (2006-03-15). "Male Star of Tomorrow: Brandon Routh". Variety. Retrieved 2008-11-06. ^ a b Scott Chitwood (2006-05-05). "Superman Returns Set Visit - Part 4". Superhero Hype!. Retrieved 2008-11-08. ^ Bryan Cairins (October 19, 2012). "Actor Daniel Cudmore on Halo, Colossus, Twilight & Superman?". Newsarama. Retrieved September 13, 2015. ^ a b c Cathy Dunkley (2005-01-06). "WB finds super nemesis". Variety. Retrieved 2008-11-06. ^ a b Jeff Jensen (2006-06-16). "Five things you need to know about Superman Returns". Entertainment Weekly. Retrieved 2008-11-08. ^ Ethan Sacks (2013-06-12). "'Man of Steel' star Amy Adams' super thrill: Getting dream role of Lois Lane she'd imagined since childhood". Daily News. Retrieved 2014-09-11. ^ Scott Chitwood (2006-05-05). "Superman Returns Set Visit - Part 6". Superhero Hype!. Retrieved 2008-11-08. ^ Murray, Rebecca. "Interview with James Mardsen: Marsden on "Heights," "Superman Returns," and "X-Men 3"". About.com. Archived from the original on 2010-10-06. Retrieved 2009-09-21. ^ Steve Head (2006-04-18). "Superman Returns: The New Lex Luthor". IGN. Retrieved 2008-11-07. ^ Scott Chitwood (2006-05-05). "Superman Returns Set Visit - Part 13". Superhero Hype!. Retrieved 2008-11-08. ^ a b c d e Jeff Jensen (2006-06-23). "Greatest American Hero?". Entertainment Weekly. Archived from the original on 2012-07-01. ^ "News: Spacey Talks Superman Returns!". Latino Review. 2006-06-19. Retrieved 2011-02-02. ^ Scott Chitwood (2006-05-05). "Superman Returns Set Visit - Part 5". Superhero Hype!. Retrieved 2008-11-08. ^ Mel J (28 June 2006). "Superman Returns (2006)". IMDb. ^ a b c Michael Fleming; Cathy Dunkley (2004-07-18). "Supe's on with 'X' man". Variety. Retrieved 2008-11-06. ^ Harry Knowles (2004-10-20). "Bryan Singer on Superman!". Ain't It Cool News. Retrieved 2008-11-06. ^ Pamela McClintock (2005-10-30). "Legendary soups up pic presence". Variety. Retrieved 2008-11-06. ^ Cathy Dunkley (2004-10-19). "Singer's Superman ready to don cape". Variety. Retrieved 2008-11-06. ^ Ghostboy (2005-03-01). "Ghostboy Interviews Dan Harris!!". Ain't It Cool News. Retrieved 2008-11-07. ^ Don Groves (2005-02-21). "Oz state makes 'Super' bid". Variety. Retrieved 2008-11-05. ^ Michael Fleming (2005-04-04). "'Super' role for Langella". Variety. Retrieved 2008-11-05. ^ a b Jeff Jensen (2006-04-14). "'Super' Men". Entertainment Weekly. Retrieved 2008-11-08. ^ Jeff Andrews (2005-10-17). "It's big, it's costly; it's the Superman movie". The Sydney Morning Herald. ^ Matt Adams (2005-01-25). "'Superman' flies in to the north-west". The Northern Daily Reader. ^ Scott Chitwood (2006-05-05). "Superman Returns Set Visit - Part 1". Superhero Hype!. Retrieved 2008-11-08. ^ Michael Bodey (2005-11-24). "Super Sydney". The Daily Telegraph (Sydney). ^ Steve Head (2006-05-11). "Superman Returns: Daily Planet Details". IGN. Retrieved 2010-02-04. ^ Sheigh Crabtree (2004-08-18). "Super shutout: ESC cuts staff". The Hollywood Reporter. ^ Scott Chitwood (2006-05-05). "Superman Returns Set Visit - Part 7". Superhero Hype!. Retrieved 2008-11-08. ^ Harry Knowles (2006-06-19). "What Did Rhythm & Hues Do To Marlon Brando To Make Him Speak In SUPERMAN RETURNS? Behold!". Ain't It Cool News. Retrieved 2008-11-11. ^ Christy Lemire (2006-06-23). "At the Movies: 'Superman Returns'". San Francisco Chronicle. Archived from the original on 2008-10-09. Retrieved 2008-07-24. ^ Mikael Carlsson (2004-07-20). "Superman gets the Singer/Ottman treatment". Music From the Movies. Archived from the original on May 11, 2006. Retrieved 2008-11-06. ^ John Ottman (2003). Requiem for Mutants: The Score of X2 (Featurette). X2 DVD: 20th Century Fox. ^ Spence D (2006-07-27). "Superman Returns' Musical Odyssey". IGN. Archived from the original on 2007-06-23. Retrieved 2008-11-06. ^ a b Smith, Sean (2 July 2006). "A Flying Leap". The Daily Beast. Archived from the original on 11 June 2013. My production budget on "Superman Returns" was $204 million. The approved budget was $184.5 million. We had projected overages for visual effects, and there was a sequence that I wanted that was going to cost an extra $2.3 million. So the hard, honest number is $204 million. ^ a b Jonathan Bing (2005-07-14). "Comicbook films striking up the brand". Variety. Retrieved 2008-11-06. ^ Jeff Goldsmith (2006-07-18). "Piqued by prequels". Variety. Retrieved 2008-11-06. ^ "Superman Returns". Apple QuickTime. Retrieved 2006-07-20. ^ a b "Superman Soars With Over $280 MM in Tie-Ins". Promo Magazine. 2006-06-01. Archived from the original on 2007-10-28. Retrieved 2007-10-28. ^ "Superman Returns". Warner Bros. Retrieved 2006-06-20. ^ "SUPERMAN RETURNS: THE MOVIE AND MORE TALES OF THE MAN OF STEEL". DC Comics. Archived from the original on 2009-06-30. Retrieved 2009-09-21. ^ "Superman Returns For Author Wolfman". Comics Bulletin. Archived from the original on 2011-08-10. Retrieved 2009-09-21. ^ "Superman Returns Flies Into Retailers". IGN. 2006-11-20. Retrieved 2009-09-21. ^ Teather, David (2007-11-30). "Fade to red". The Guardian. London. Retrieved 2009-09-30. ^ Staff (2006-05-28). "Coulthard is Red Bull's superman". Formula One. Archived from the original on 2007-04-05. Retrieved 2006-10-04. ^ "Special Paint Schemes". Jeff Gordon Online. Retrieved 2013-01-06. ^ "Superman Bayliss Takes Ducati's 250th World Superbike Win At Brands Hatch". Ducati.com. Archived from the original on 2007-12-20. Retrieved 2007-09-08. ^ "The Science of Superman on National Geographic Channel". Superhero Hype!. 2006-06-12. Retrieved 2008-11-08. ^ a b Eric "Quint" Vespe (2006-07-22). "SDCC: Quint on SUPERMAN RETURNS gag reel & sequel talk with Singer + SUPERMAN 2 footage with Richard Donner!!!". Ain't It Cool News. Retrieved 2008-11-08. ^ Pamela McClintock (2006-07-16). "Filmmakers resist putting pix to the test". Variety. Retrieved 2008-11-06. ^ Stax (2006-05-30). "Superman's New Date". IGN. Retrieved 2008-11-08. ^ a b "Superman Returns (2006)". Box Office Mojo. Retrieved 2009-10-05. ^ Pamela McClintock (2006-03-30). "Super project for Imax". Variety. Retrieved 2008-11-06. ^ Scott Bowles (2006-07-03). "High-altitude takeoff for Superman". USA Today. ^ "2006 Domestic Grosses". Box Office Mojo. Retrieved 2008-11-06. ^ "2006 Worldwide Grosses". Box Office Mojo. Retrieved 2008-11-06. ^ "Superman Returns (2006)". Rotten Tomatoes. Retrieved March 19, 2018. ^ "Superman Returns reviews". Metacritic. Retrieved 2008-11-04. ^ "CinemaScore". cinemascore.com. Archived from the original on 2015-04-05. ^ Richard Corliss (2006-06-18). "The Gospel of Superman". Time. Retrieved 2008-11-07. ^ Joe Morgenstern (2006-06-28). "Saving the Day". The Wall Street Journal. ^ Peter Travers (2006-06-22). "Superman Returns". Rolling Stone. Retrieved 2008-11-07. ^ J. Hoberman (2006-06-20). "Myths American". The Village Voice. Retrieved 2008-11-07. ^ James Berardinelli. "Superman Returns". ReelViews.net. Retrieved 2008-11-07. ^ Roger Ebert (2006-06-27). "Superman Returns". Chicago Sun-Times. ^ Mick LaSalle (2006-06-27). "He's Back". San Francisco Chronicle. Retrieved 2008-11-07. ^ "The Call Back". The New York Times. 2009-05-03. Retrieved 2009-09-29. ^ "Deep Focus: Superman Returns". indieWire. 2012-01-09. Retrieved 2012-01-21. ^ Brock, Ben (February 4, 2014). "Bryan Singer Says 'Superman Returns' Was Made For "More Of A Female Audience," Sequel Would've Featured Darkseid". IndieWire. Archived from the original on 2014-10-06. Retrieved February 5, 2014. ^ "Empire Features". Empireonline.com. Retrieved 2009-10-17. ^ "Superman Returns". British Academy of Film and Television Arts. Retrieved 2008-11-08. ^ "Past Saturn Awards". Saturn Awards.org. Archived from the original on 2011-05-12. Retrieved 2008-11-08. ^ "27th Annual Razzie Award Nominees for Worst Supporting Actress". Golden Raspberry Awards. Retrieved 2008-11-08. ^ a b Clark, Samantha (2006-09-21). "Superman flexes high-def muscle". Video Business. Retrieved 2009-09-21. ^ "Superman Ultimate Collector's Edition". DVD Talk. Retrieved 2008-12-31. ^ "'Superman' Flies in at No. 1". Home Media Magazine. 2006-12-07. Archived from the original on 2011-07-17. Retrieved 2009-09-21. ^ "Warner Ups HD Slate". Home Media Magazine. 2007-01-08. Archived from the original on 2011-07-17. Retrieved 2009-09-21. ^ "Best-selling DVDs of 2007" (PDF). MSN. Archived from the original (PDF) on 2011-09-28. Retrieved 2009-09-21. ^ "Studio Sets Super Sequels". IGN. 2006-02-23. Retrieved 2008-03-13. ^ a b Kellvin Chavez (2008-10-09). "Exclusive: DC Comics President Gives Superman Update". Latino Review. Archived from the original on 2008-10-11. Retrieved 2008-10-09. ^ Heather Newgen (2006-06-16). "Superman Returns' Lois Lane, Kate Bosworth". Superhero Hype!. Retrieved 2008-03-13. ^ Anne Thompson (2007-07-10). "Spacey set for Superman sequel". Variety. Retrieved 2008-03-13. ^ Heather Newgen (2006-06-09). "Huntington Signed for Two Superman Sequels". Superhero Hype!. Retrieved 2008-03-13. ^ Edward Douglas (2007-11-08). "Frank Langella on the Return of Perry White". Superhero Hype!. Retrieved 2008-03-13. ^ Michael Fleming; Pamela McClintock (2006-05-15). "Inside Move: Superman playing with Singer's sked". Variety. Retrieved 2008-03-13. ^ Clint Morris (2010-11-05). "What would Dougherty's Superman sequel have been?". Moviehole. Archived from the original on 2013-05-16. Retrieved 2010-12-02. ^ Frosty (2007-05-11). "Bryan Singer – Exclusive Video Interviews at the 2007 Saturn Awards". Collider.com. Retrieved 2008-03-13. ^ Scott Chitwood (2006-07-22). "Exclusive: Singer on Superman Sequel & DVD". Superhero Hype!. Retrieved 2008-03-13. ^ Pamela McClintock (2006-08-13). "WB mulls Superman redux". Variety. Retrieved 2008-03-13. ^ "Horn Planning Superman Sequel for 2009". Superhero Hype!. 2006-08-18. Retrieved 2008-03-13. ^ a b Olly Richards (2008-03-12). "Singer Talks Superman Returns Sequel". Empire. Retrieved 2008-03-14. ^ Stephen Galloway (2007-07-10). "Studios are hunting the next big property". The Hollywood Reporter. ^ Michael Tsai (2006-11-08). "Sequel to Superman Returns due in 2009". The Honolulu Advertiser. Retrieved 2008-03-13. ^ Michael Fleming (2007-03-13). "United Artists grabs Singer thriller". Variety. Retrieved 2008-03-13. ^ "Superman Sequel Eyeing March '08 Start". Superhero Hype!. 2007-03-19. Retrieved 2008-03-13. ^ Marc Graser (2007-10-21). "Superman writers won't return". Variety. Retrieved 2008-03-13. ^ Stax (2008-01-14). "JLA Deadline Looms". IGN. Retrieved 2008-03-13. ^ Frosty (2008-04-23). "Brandon Routh Exclusive Video Interview - Lie to Me". Collider.com. Retrieved 2008-08-04. ^ Josh Wigler (2009-07-06). "Brandon Routh Says His 'Superman' Contract Has Expired". MTV News. Archived from the original on 2014-01-01. Retrieved 2010-12-02. ^ Schuker, Lauren A. E. (2008-08-22). "Warner Bets on Fewer, Bigger Movies". The Wall Street Journal. Archived from the original on 2011-03-21. Retrieved 2008-10-22. . .
Daniel Wallace. The Art of Superman Returns. Chronicle Books. ISBN 0-8118-5344-6. Daniel Wallace. Superman Returns: The Visual Guide. DK Children. ISBN 978-0-7566-2066-0. Marv Wolfman. Superman Returns, the Novelization. Hachette Book Group USA. ISBN 0-446-60652-9. Wikimedia Commons has media related to Superman Returns.